SCCC arose out of a Stockport MBC document issued in 1999 setting out a “Strategy for Cycling”. Included in this was the formation of a Community Cycling Club to encourage residents to cycle and to provide an entry-level club for newcomers and returning cyclists. Rides would be relatively short and within everyone’s capability. The original emphasis was on youngsters between the ages of 7 and 16, adult newcomers and families with younger children. This was to fill a glaring gap in the cycling market as most other cycling clubs do not take riders under the age of 12 and if they do, want their parents to be present. Rides of the short distances we aim for are not even considered by these clubs. The Council provided facilities at the Lapwing Centre in Brinnington and the NHS funded the initial training of leaders including first aid training. As a result, all leaders are qualified as British Schools Cycling Association Off-road leaders..
SCCC took off and was well supported by the local youngsters. Although SCCC was aimed at Stockport residents, one family travelled regularly from Hale Barns as Trafford MBC had no equivalent facility. As well as the continuing support from the Council and the NHS Trust, we were successful in obtaining local grants for hi-viz rainwear and T-shirts which were awarded for regular attendance. SCCC was also able to access the Council minibus to enable the riders to go further afield and experience riding on different routes. We were then successful in gaining an award offered to Sports Clubs by United Utilities to enable us to take 10 members to watch the 2002 Commonwealth Games cycling event at the Velodrome. More recently, SCCC has worked with Stockport NHS Primary Care Trust in setting up the Reddish Vale Healthy Living Centre. This initiative, funded by the National Lottery, supported projects aimed at improving the health of residents living adjacent to the Reddish Vale corridor. 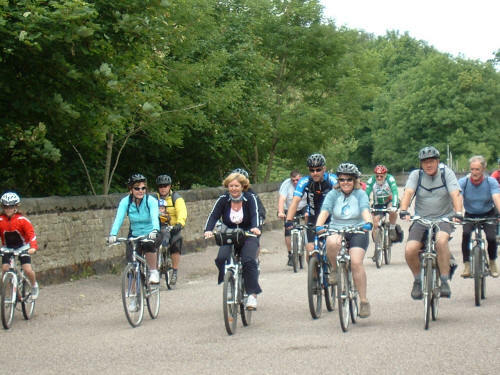 SCCC actively assisted in leading evening and weekend rides for adults organised by the NHS Trust as part of this initiative and has now taken over the rides following the closure of the Scheme. 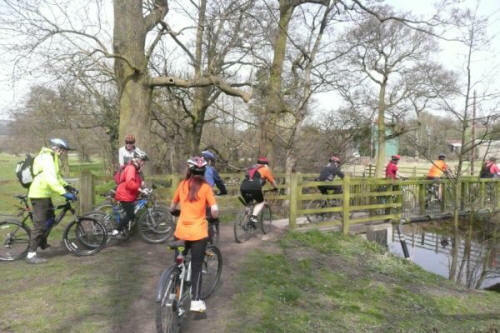 Many of the ideas for SCCC were based on the existing Manchester Community Cycling Club based at Boggart Hole Clough which operated in a similar type of area and on similar lines. It was decided that SCCC should work on a “drop in / drop out” basis with no obligation to attend every week – although those that did clearly benefited from the regular exercise. There was to be a modest joining fee (£2) and a ride fee of an affordable 50p (now £1) would be charged to defray expenses. Since we started over 850 people have ridden with the club. Ride distances were originally envisaged at around 4–6 miles but rapidly we found that the riders of all ages easily managed 8–10 miles. Rides were usually tailored on the day to meet the abilities and ages of the riders who attended. 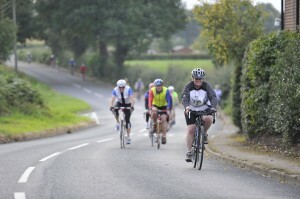 We knew that we could not cater for riders whose main intention was to race or to ride long distances at speed. We have, therefore, established links with other clubs who we know can develop these riders and one of our ex-riders became the North West Under 10 road racing champion. 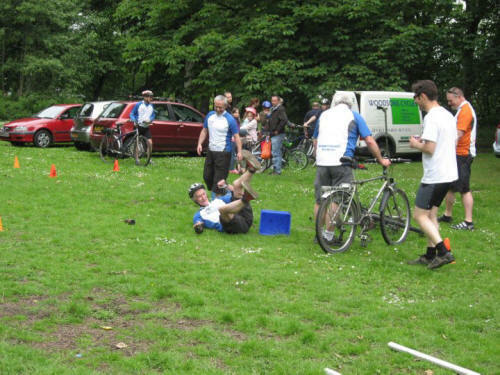 However, we did and still do encourage the riders to develop their riding skills and we have set up obstacle courses to provide a bit of fun whilst developing these skills. British Cycling used to organise a challenge event combining a skill test with a short-distance speed test. We staged the local heat on several occasions and provided several finalists. We were aware that our riders would struggle on the speed section but could hold their own on the skills and the pinnacle came when one of our girls gained a silver medal. For a number of reasons, numbers declined in late 2004 and in 2005 it was decided to re-launch SCCC as a family Club and to “go mobile”. We knew from enquiries that there were a number of families who wanted short-distance rides with other families and, generally, had transport for the family and their cycles. 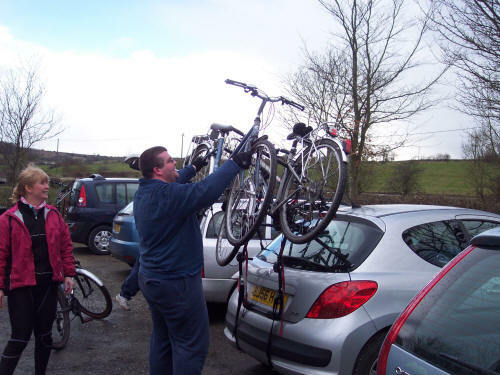 Where there is any difficulty with transport we can often arrange a lift for passengers and we currently have four bikes of medium size which can be borrowed for a club ride. We are quite an unusual Club in that we have nearly as many female members as male members, a balance many cycling organisations are still trying to achieve. In 2008 Jim Court who founded SCCC was awarded the CTC Volunteer of the Year award for the North West in recognition of the continuing success of SCCC. Since 2005 over 850 riders have ridden with us and many have become regulars. Since the re-formation in 2005, the Club has held a number of longer expeditions with an Annual Club Weekend in September to a variety of locations. 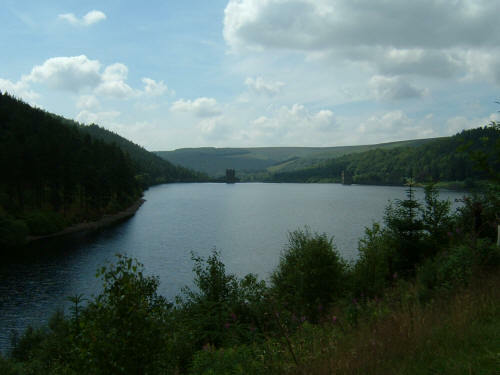 There have also been a number of unofficial long-distance expeditions including the Coast to Coast, Way of the Roses, Cross Wales and the Transpennine Trail. This culminated in 2012 with eight riders undertaking a three and a half week Challenge from Lands End to John o’Groats covering 1000 miles and raising thousands of pounds for Beechwood Cancer Care. None of these riders had covered any great distances before joining the Club within the last three years. In 2015 another group tackled this route in reverse, starting in Scotland. In 2018, a group of our Ladies even ventured to Holland for a cycling holiday. In 2012 the Club was awarded the prestigious award of Stockport Sports Club of the Year. The Club was the first cycling Club to receive this award, made even more special in that the Club is not a competitive Club and won against opposition from more mainstream sports such as Athletics, Cricket and Football. The award was made in recognition for our work in the public realm as well as the various amounts we have raised for Charity over the years. In 2014, the Club’s founder, Jim Court, was recognised for his efforts by Sport Stockport when he was awarded the Stanley Matthews Trophy as the Unsung Hero of Sport in Stockport for 2014. In 2015 the Club also added a Monthly Saturday Afternoon ride over a similar distance to the Evening rides to allow people to continue the impetus through the winter. Ultimately these rides now run throughout the year. In 2015 the Club also made another change adding Monday evening rides to the existing Wednesday evening programme. The aim, as well as providing an alternative date to ride. 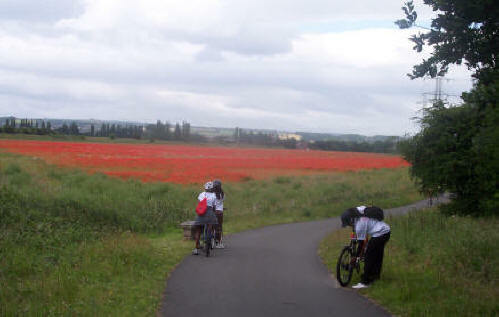 enabled leaders to do a “recce” of the Wednesday ride. Both rides cover the same route. In an attempt to encourage more people in the Stockport Area, the Club has now entered into a partnership with Ceracycloan, who provide training opportunities for youths as well as offering second hand bikes and repair services and Woodsons Cycles, who can provide electric bikes as well as an excellent servicing and repair facility. The three partners work together on projects throughout the year. Since 2017 SCCC has hosted a number of rides with Cetacycloan and Cale Green School, providing short but safe rides around the local district. SCCC has also worked with Ceracycloan to assist with rides for Cycling UK’s Big Bike Revival to encourage people back into cycling. In 2018 SCCC took over the running of the Cycling activities within the PARIS scheme run by LifeLeisure. These rides allow people who have been identified by their Health Professional as benefiting from exercise to cycle in a safe environment with experienced leaders to oversee the rides. Riders can ride for up to an hour on a local park circuit.